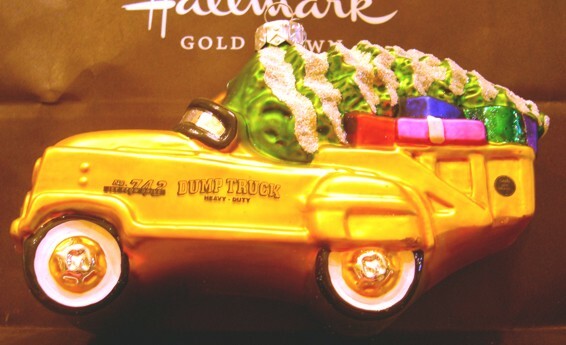 Inspired by the Murray Dunp Truck offered in the Kiddie Car Classics editions of Keepsake Ornaments and Collections. More than a century ago, in the days when Christmas trees were lighted with real candles for brief, magical moments, European craftsmen began producing beautiful ornaments of blown glass. These treasures, called kugels, were known affectionately as "tree jewelry." Today the artistry of blown glass ornaments is being rediscovered and given new importance at the holiday season. Whether you display these lovely treasures on your tree or mantel, or feature them in a centerpiece, you and your guest will enjoy their elegance, shimmering beauty, and brilliant colors. Each ornament has been individually hand-blown and meticulously painted by hand. Made for Hallmark Cards, Inc. in Poland. A time-honored tradition, Hallmark offered Blown Glass ornaments from 1998 through 2001.